Custom Acrylic Note Holders. 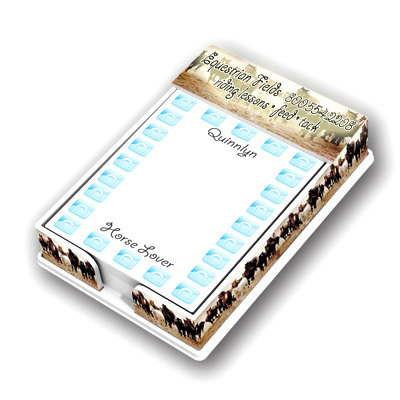 Free Custom Shape and Imprint on Holder and Sheets. 4"x6"
Custom Acrylic Note Holders Printed in Full Color in Bulk. Free Custom Shape! Promotional, Inexpensive. Budget Prices in the USA and Canada. Wholesale advertising Acrylic Note Holders on sale. Our Custom Acrylic note holder comes with 200 loose sheets. it holds 4"x6" sheets. 60 Lb. white paper. Free personalization on sheets! 1-4 Color Process imprint on acrylic holder. Lowest cost in North America.Free Artwork Design. American Clients pay no taxes. The unit prices below include you full color custom imprint on the acrylic holder, full color custom imprint on all 200 sheets and free custom shape! • Acrylic Note Holder is perfect for desk top notes. • Free Personalization on sheets. Print Process: 1-4 Color Process imprint. Sheet Imprint Area: 3 3/4" x 5 3/4". Approx. Dimensions: 4" x 6". Sheet count: 200 sheets, loose sheet paper filler.